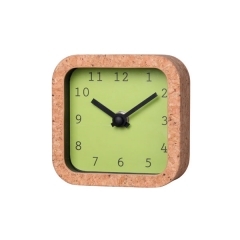 Bolted down with bare metal rivets, the triple circle resin case featured on this time zone desk clock, cube is compellingly contemporary and wonderfully worldly yet ruggedly rustic. 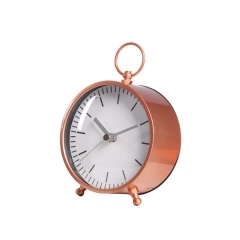 Use the three little side-by-side round clocks to keep up with the time zones of long distance loved ones or the far away cities you dream of. 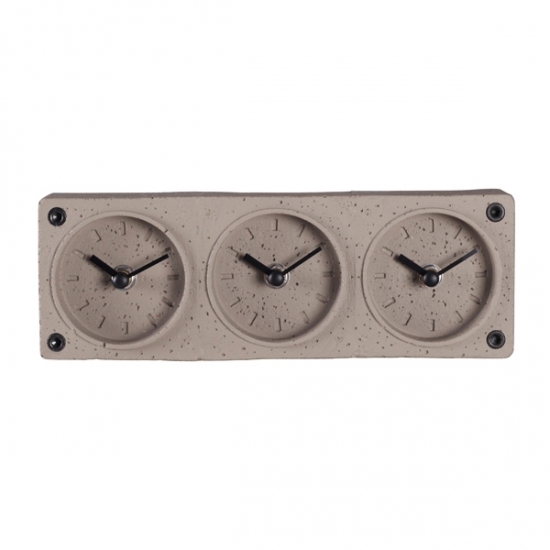 Rectangular shape outer, 3 clocks embedded in the clock body, adding screw element, make a Industrial style for home decor. 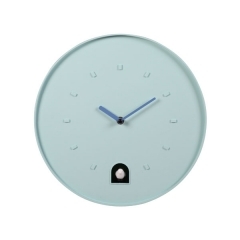 Discover a wide selection of ELITE GROUP clocks ranging from alarm clocks to wall clocks suitable for interior decor, trendy style from vintage style to modern style and Nordic style, we are the original design manufacturer, meanwhile, OEM & OEM service is available for your order, for the next project, get in touch with Elite staff now. 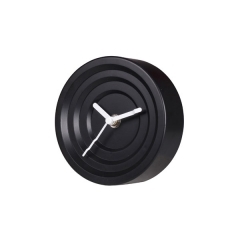 The creative modern small table clock with black and white color, the Roman Colosseum style casing, cross-play a new and unique clock design. 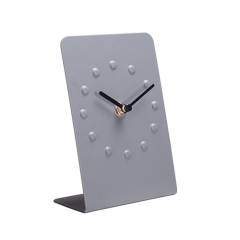 "L" shaped metal table clock with embossed dots on 12 hours' position, a novel clock worth to be sitting on your desk. 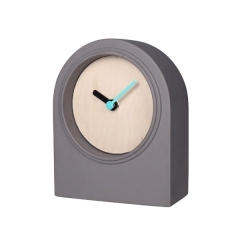 A small analog modern desk clock, using concrete material characteristics, the integrated mold makes the concave dial, giving a new and eye-catching effect. Shake up your room decor with interesting materials and fun color! 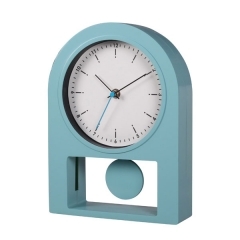 This small desk clock is available in two vibrant colors. Choose from: Light Blue and Green. 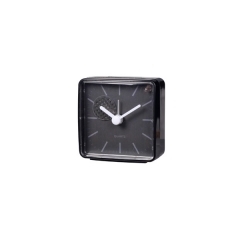 Situated in a sturdy stand up casing made out of plastic and fitted with aluminum ticker hands, this large mantel clock is durable, decorative and designed to complement a contemporary atmosphere. 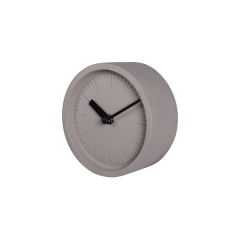 Inspired by the simplistic beauty of modern concrete creations, this mantel shelf clock makes it easy to infuse hints of contemporary chicness into your home or office design schemes. 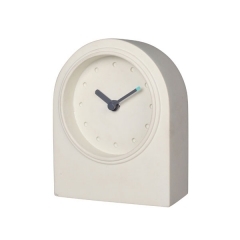 Placed in a case crafted from concrete, this small mantel clock is extra durable and decoratively out of the ordinary. 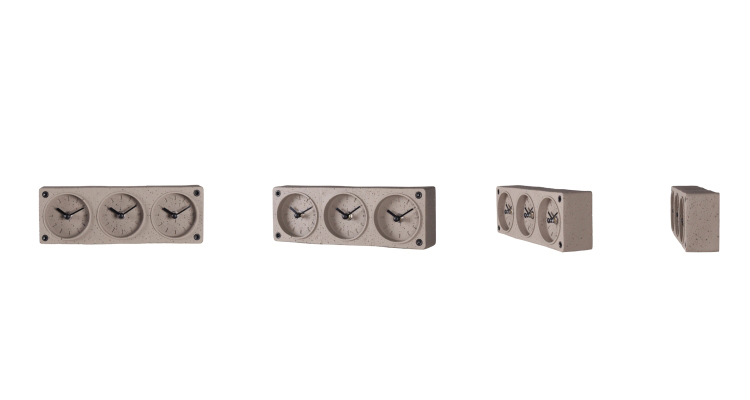 The enigmatic essence of Parisian charm is perfectly personified by these decorative table clock pretties. 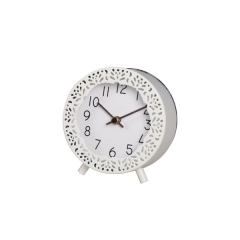 Decorate the bedroom with this beautiful, tasteful bedside small desktop clock.